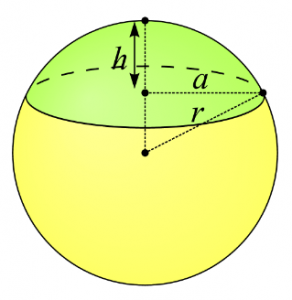 The spherical cap is no different but a part of the sphere itself that falls over the plane of a sphere. If you know the values of the base area, radius, and the height of a sphere then this is easy to calculate the area of the shape. The other popular name for the spherical cap is spherical dome. Sometimes, you will be given the base radius and sometimes you will be given the value of sphere radius. Make sure that you know the difference between these two terms and apply the respective formula accordingly. Here is given a diagram to give you an accurate idea of the concept. Also, we have given the spherical cap volume formulas to make the thing easier for you. Based on the formula given earlier, H will be the height, R is the sphere radius and a is the base radius. The value of pi is fixed in mathematics. If you know the height and radius of a spherical sector then calculating the volume of a spherical sector would be easier. 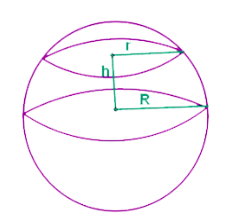 Where R (r1 + r2) is the radius and ‘h’ is the height of a spherical segment. When semi-circle is revolved around the diameter with less than 360-degree angle then the solid shape will be named as the spherical wedge. At the same time, Spherical Lune is the total space occupied within a sphere and surrounded by two half circles that will meet further at antipodal points. You must be shocked what we meant by antipodal here. This is the point marked on the surface of a sphere which is diametrically opposite to each other. When a line is drawn from one point to another it will make a straight line. Here, we have given the formulas for spherical wedge and Lune to calculate the Volume, surface area, and the arc length.